104 weeks. Full-time, 20 hours per week. At the successful completion of this course the participant will receive an Advanced Diploma of Travel and Tourism Management SIT60116. Those students who do not complete this course or who are deemed not yet competent in units will still receive a Statement of Attainment for all units completed. Attainment of this qualification may enable the participant to fill positions in account manager, business development manager, director of groups and incentives, director of marketing, director of product development operations manager, director of sales or general manager. 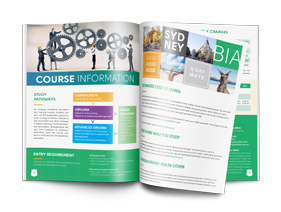 After achieving this qualification candidates may choose to progress into a Bachelors program with one of the Business Institute of Australia’s partner Universities. This qualification is made up of 27 units of competency (17 core units and 10 elective units).